This was the best thing I saw this morning. 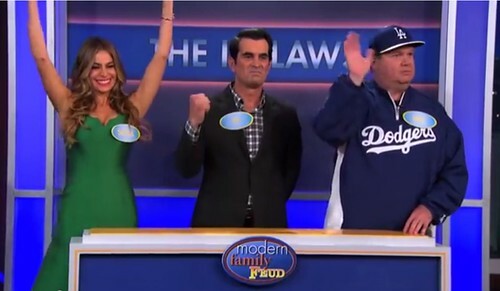 The cast of Modern Family going up against each other in a game of family feud. This series is one of my favorites in the past few years and is my go to show whenever I need a good laugh. This is them as themselves but still in character playing a game of Family Feud and hosted by Jimmy Kimmel. I had fun watching these guys try and do something else outside of their TV personas. But it’s hard to tell if this is really what their real life selves are or if they are still stuck in their TV mode. Regardless, it’s fun to watch them interact. It’s also hilarious how both Ed (Jay Pritchet) and Sofia (Gloria) have no idea what a Facebook is. The video is chopped into 3 parts, each containing a question that both teams namely, The Pritchets and the In-Laws need to tackle. Who wins? We win!